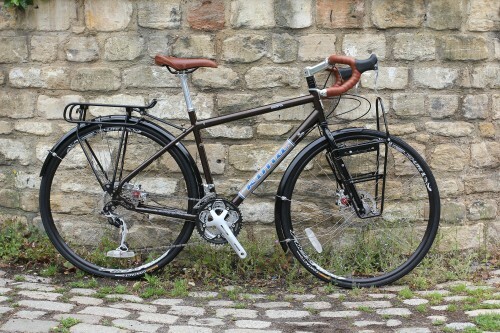 The Kona Sutra is unashamedly a touring bike. It’s heavy, it feels more like a mountain bike than a road bike when you’re on it and it’s got enough carrying capacity to take the kitchen sink. If you’re going for a quick ride with your mates on their carbon bling, the Kona is going to disappoint you. If you’re planning to cruise into the sunset, it’ll put a smile on your face. That’s just what I did when I got my hands on it. I took a Friday off work, rode it in the Thursday before with everything on it and just set off after work for a three and a half day jolly. I deliberately loaded it up with more than I would normally take for such a short tour to give it (and myself) a good workout. I work in Bristol and set off towards Gloucester, crossed the Severn and on to Abergavenny through Monmouth. Then up to Rhayader, across the Elan valley to Tregaron, back across the mountains to Builth Wells and the train home to Bath from Abergavenny. The bike passed with flying colours. I was impressed with the comfort of the saddle and the bars and the stability of the bike under load (especially crawling up devil’s staircase – the sign says 25% if you’re not familiar with it). So what do you get for your not quite a grand? A full (butted) steel frame, with steel Project Two forks, bar end shifters, disc brakes, and a full complement of accessories like racks and mudguards. Pretty much ready to go really. I’ve ridden the bike with a variety of luggage options. 4 year old boy on childseat with and without front panniers, 4 year old boy on trailer bike with rear panniers, full touring livery with panniers front and rear and bar bag, just a barbag, just rear panniers; it handles it all beautifully, without batting an eyelid. The bike feels very solid with a full load on it. Which is what you’d expect from a touring bike. But unlike other touring bikes, it is still enjoyable to ride without a load; it doesn’t suffer from that deadness you can get on bikes designed to carry weight. Conventional wisdom has it that you wouldn’t want disc brakes on a tourer. Well, I think conventional wisdom is wrong. No cantilever brake I’ve ever used comes remotely close to giving the same kind of confidence the Avid BB7’s that come on this bike give you. They are simply awesome. And as they are cable operated, you shouldn’t come across too many problems you can’t deal with, as long as you’re careful with the rotor. If you are worried, the fork has canti bosses so you could always just pop a spare pair on. Just disconnect the disc brake, connect cable to cantis and you’re on your way again. The rear triangle does not have canti bosses. Like all discs they need a little bedding in, so if you don’t get awesomeness from the word go, just give it a few miles. Conventional wisdom also dictates that you borrow some parts from the world of mountainbiking, in particular chainset, rear derailleur and cassette. Here I would have to agree. The Sutra’s chainset deviates from that; it’s a standard road triple (52-39-30) you get here, and I would swap it out for a nice Deore 48-36-26 unless you’re planning to stick to the flatlands. In fact this is exactly what I’ve done on the Sutra I’ve just ordered for myself (I like it rather a lot and can’t face having to hand the test specimen back to those nice peeps at Kona). Another MTB standard you often find on touring bikes is wheel size. The argument goes that 26” wheels can be built stronger and it’s easier to find spares for this size. The Sutra has 700c wheels. I prefer this, because it means there’s more compatibility with my other bikes in terms of swapping tyres and tubes around and there’s a bigger selection of road/commuting type tyres available to choose from. The wheels are pretty bomb proof, no tweaking needed at all after 500 loaded miles of abuse. 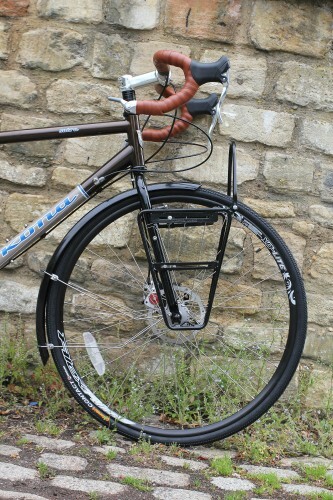 The Kona Sutra comes with racks front and rear as standard, as well as mudguards. Thank you, Kona, for including mudguards. You need them in the UK and it’s jolly nice you don’t have to buy them separately. The front rack arrangement is a bit strange. The particular flavour Project Two fork the Sutra comes with is marked “touring”, yet it doesn’t have the standard bosses that most lowriders are designed for. Instead it has bottle bosses on both sides of the fork. I think this is an interesting design choice. If you look at pictures of loaded touring bikes, not that many actually carry front panniers. In many ways a couple of extra bottles instead of panniers is not such a bad idea. Anyway, back to the front rack. It bolts on to the canti bosses with brackets and to one of the bottle bosses. After about 250 miles of touring with not particularly heavy panniers (2.5kg of tent on one side, sleeping bag and ¾ thermarest on the other) those brackets had started bending slightly. If you’re going on a tour and you’re taking front panniers I would get something sturdier. I’m sure one of the racks the excellent Tubus offers would do the job, or maybe Kona just need to spec stronger brackets. 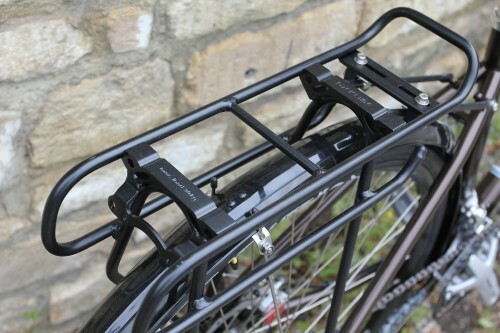 I’ve used this type of rack before on a mountain bike tour and it worked fine then. My other complaint about this arrangement is that the panniers sit quite high on the front wheel. I guess this might be designed to clear ruts if you take it off-road. Fact is that a lower centre of gravity would work better. Front racks are also called lowriders, there might be a clue in that. The rear performed much better. The major comment to make here is that the brake calliper sits between the seat and chainstays, which means you can use a normal rack. Former incarnations of the Sutra had the disc calliper in the normal position, interfering with the rack. Nice to see Kona have sorted this one out. I clipped my panniers on to the lower of the horizontal tubes on each side and found that a very solid and stable arrangement. The paint had started rubbing away after 250 miles of having the panniers on, but I wouldn’t personally worry too much about that. I wouldn’t look to upgrade the rear; I would do something about the front. The geometry is clearly informed by Kona’s offroad heritage, very slopy top tube – which gives nice standover height - and a nice and high front-end. The sizing is also more akin to mountain biking than to road bikes, and it’s worth bearing this in mind when you order. I tested the 54cm, which on paper should be perfect for me. It became apparent quite quickly that a size up would have been a better bet. The frame and forks have nearly all the braze ons you’d expect from a touring bike: racks front and rear, mudguards, bosses for five bottle cages and even a pump peg. The only that’s missing for me is a braze on to take spare spokes (you can get away with one size of spares for both wheels, which is nice). You could argue that you just pop ‘em in with your tent poles (which is what I did) or you zip tie them to the frame somewhere – not a biggy. The finishing kit is a very sensible mixture of parts, using higher quality where you need it (XT rear derailleur for example) and saving a bit of money where it doesn’t make a big difference (Tiagra front derailleur). The saddle is surprisingly nice although I couldn’t stop myself putting my trusty Brooks on for the mini tour. The bars are Kona’s own brand touring bars; they have a shallow drop and are just right for spending hours and hours on the tops. Very comfy. The brake levers didn’t work too well for me, they feel quite chunky and look they mimic Shimano style shifters. I’m used to Campag myself and would in time swap these out for something smaller. I’m not sold on the bar tape; although it’s nice and squishy, it becomes a bit slippery in the wet (if you, like me, don’t wear gloves) and I just don’t like the colour. The Kona Sutra is an awesome package, especially given that it scrapes in under the Cyclescheme limit. It’s a fully equipped, heavy duty expedition touring bike that’s ready to take anything you care to throw at it. There are a few compromises to get it in under a grand, but I feel those have been made in the right places and are easily swapped out. Brakes: Avid BB7 Road Disc 6"
This is a heavy duty expedition touring bike. When you pick it up, it’s obvious it’s built to last and to withstand anything you choose to throw at it. Very very solid. The usual excellent quality you’d expect from a Kona. 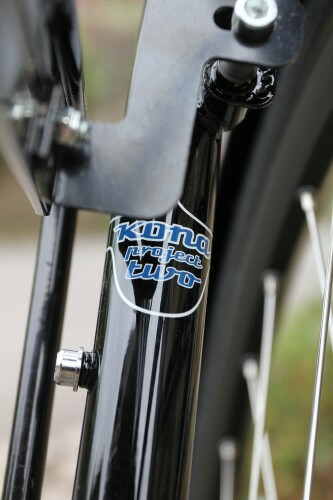 Both frame and fork are made from Kona’s own Cro-moly. Steel is real. Very similar to the Kona mountain bike I used to have. Sloping top tube, great standover height. I tested a 54cm which on paper should fit me fine. In reality it’s a bit short in the top tube and I should have gone with a 56. Try before you buy, and err on the larger size I would say. Armchair comfy; it’s a proper mileater. You wouldn’t want this kind of bike too stiff, having said that, it didn’t feel sloppy at all. Efficient for a touring bike. You’re not going to win any sprints on this thing, but absolutely nothing bad to say about efficiency. There was a tiny amount of toe overlap, but that’s probably caused by my preference for having my cleats absolutely as far back as they will go. It was not a problem. Nothing special to say about the handling when the bike is unladen, certainly doesn’t feel as dead as some touring bikes. Responsive enough to weave through traffic. Once you pop some panniers on it, you really notice how nice it handles. The frame material and geometry, the really quite comfy WTB saddle, lovely Kona Sweep handlebars and the tyres. You could make it a bit more efficient by swapping out the tyres for some faster ones, if you were worried about speed. I suppose you could take the front rack off. If you want to go fast, you might be better off with a racing bike though. Low and slow, cruise it up that hill! Bar-end shifters with Tiagra / XT combo, there’s not really anything to go wrong. 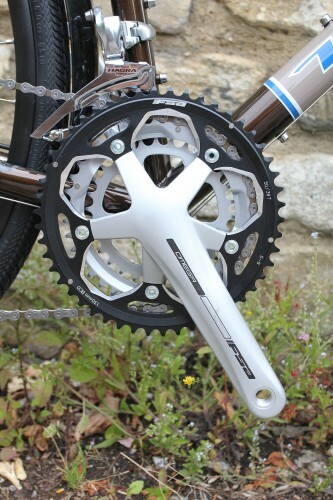 This is the perfect drivetrain spec for a touring bike. 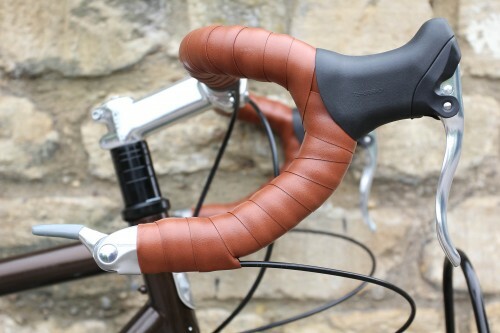 I would spec exactly the same shifters and derailleurs if I were building up from scratch. I would change the chainset though. Especially when laden with 4 panniers you run out of gears fairly quickly. Or maybe I should have stayed away from the Elan valley? Pretty bomber. No sign of any glitches after 500 miles of abuse, no wear from braking to take into account either. Should last as long as you want them to. Bomber comes at a price: weight. I wouldn't change this, mind. Lovely. Ride all day, and then some more to the pub. Pretty darn dandy considering the overall cost of the bike. I was a bit sceptical about the Continental tyres at first, but am really won over now. They are as bomber as Schwalbe marathon plus, but are lighter and roll better. Not exactly the quickest shift (as you have to reach down to the bar-ends), but that's not particularly what you are after. I didn’t get on with the brake levers that well, other than that, lovely. Especially the bars. The brake levers feel a bit big, I’d rather something a bit smaller. I suppose I’m used to older style Campy levers though, they seem more like a Shimano shape. I’d swap ‘em out for something like Cane Creek SCR5’s. Something to be aware of if you have small hands. The Avid BB7s are awesome. Good modulation, especially considering they are cable operated (which makes them a doddle to adjust). Disk brakes on a tourer is just such a good idea. The handlebars are v comfy. Did you enjoy riding the bike? Yes! Would you consider buying the bike? I have. Would you recommend the bike to a friend? If they were after a proper touring bike and understand that it'll get you anywhere, just not very fast, then yes. 26" wheels do make a lot of sense on some continents, met a chap in the Andes (on my 26" bike) who had had to make an 800km bus ride just to get new 700C tubes when the valves on his spares failed. You can get 26: rubber just about anywhere. But for European and North American touring 700C works well. What I'd have liked is more comment on the frame tubing. E.g. how does it compare in feel and weight and composition to something readers might be familiar with -Reynolds 631, Tange Prestige. It's said how it doesn't feel as dead as some tubing meant for loads, but that's it. I'd need more info on this to consider buying it when also considering other steel touring bikes.